If you're scouting for a casual yet chic look, pair an Isabel Marant cute jumper with a blue vertical striped shirtdress. Both items are totally comfy and will look fabulous together. For something more on the daring side to round off this getup, choose a pair of silver leather low top sneakers. If you're on the lookout for a casual yet absolutely chic getup, pair a navy v-neck sweater with navy vertical striped dress pants. Both garments are totally comfy and will look fabulous paired together. For something more on the daring side to finish off this getup, go for a pair of white low top sneakers. If you're on a mission for a casual yet totally stylish look, wear an Isabel Marant cute jumper and black skinny jeans. Both garments are totally comfy and will look fabulous together. 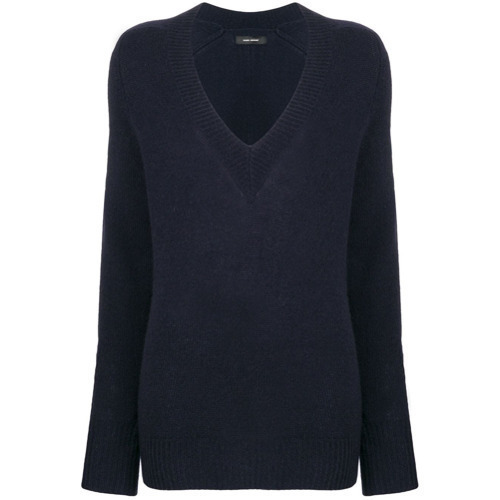 If you're looking for a casual yet absolutely chic getup, wear a navy v-neck sweater with navy dress pants. Both pieces are totally comfy and will look fabulous paired together. Rocking a pair of black leather pumps is a simple way to add extra flair to your outfit. 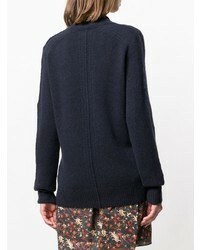 If you're on the hunt for a casual yet absolutely chic look, rock an Isabel Marant cute jumper with navy skinny jeans. Both garments are totally comfy and will look fabulous paired together. Up the cool of your outfit by completing it with navy suede ankle boots. Consider teaming a navy v-neck sweater with red geometric pajama pants, if you feel like relaxed dressing without looking like a hobo. Bump up the cool of your look by wearing black leather lace-up ankle boots. 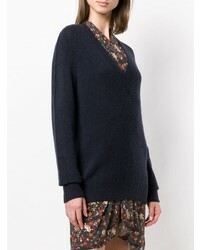 If you're on the hunt for a casual yet absolutely chic getup, pair an Isabel Marant cute jumper with blue denim shorts. Both garments are totally comfy and will look fabulous paired together. Dress down this getup with white polka dot low top sneakers.